Redi Shade Blinds… Simply Incredible! Redi Shade Blinds are unique temporary paper blinds for instant privacy. 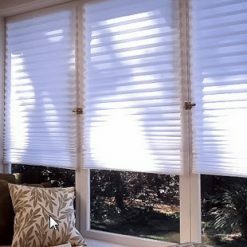 The peel-&-stick Redi Shade Blinds allows it to be mounted without hardware! Putting up blinds couldn’t be easier. Measure and trim, peel and stick! No drilling – No screws! Imagine pleated paper blinds that requires no drills, brackets or screws! That’s right… REDI SHADE IT! Once again, Redi Shade have launched a winner. An exciting, sophisticated and affordable product. A pleated paper window blind that installs in under a minute, giving you instant cover, instant privacy. Resilient enough for temporary, or permanent use. It’s the perfect product for interim cover. Waiting for custom made shutters/blinds/curtains…REDI SHADE IT! Just moved into a new home, or renting…REDI SHADE IT! Doing some renovations, or painting…REDI SHADE IT! Having curtains cleaned, blinds repaired…REDI SHADE IT! FAST… QUICK… EASY…AFFORDABLE. PRIVACY IN A FLASH! Redi Shade Blinds are energy savers, as well as sustainable. Keeps homes cooler in summer and warmer in winter, whilst being recyclable all at the same time. Imagine a product that is cordless, baby safe and hassle free. No screws, brackets or drills. Simply measure, cut, peel and stick. Our temporary paper blinds provides a feeling of privacy and security. Your windows are covered giving your instant privacy until permanent fixtures are ready to be installed. Great for renting! Great for students at res! Great for that awkward window! This pleated paper window blind can fit any window, no matter the size. Use just one, or several to cover that large window. The convenience of this product is unsurpassed! The product is made in USA from durable, long lasting treated paper. Unlike vinyl products, it will not crack or become brittle from exposure to extreme heat or cold. It secures with two colour coded, low profile clips. It is extremely affordable, has great aesthetic appeal. It’s an instant solution to a temporary problem, but is resilient enough to be a permanent fix if need be. Installs as an inside/outside window mount with no minimum mounting depth required. It can adhere to aluminium, steel, tiles, plastic, wood, smooth concrete and painted surfaces. * Not ideal for bathrooms which are not well ventilated. Black, being a solid 99% blockout.